This video shows the creation of the earth and evolution of life in under two minutes. Lovely! Of course the time scale isn't linear - it it was, the rise of life would pass in less than a blink. In this video Professor Ted Peters of the Pacific Lutheran Theological Seminary talks at SETI Institute about the mythic elements surrounding discussion of extraterrestrial life. In particular Peters takes on the assumption of some (many? most?) astrobiologists that extraterrestrials will necessarily be more "advanced" than humans, which is not consistent with what we know about evolutionary biology. He argues that if we do discover extraterrestrial life, it's more likely to be microbes than a technologically advanced society. It's a provocative position, as much of the excitement about SETI - the search for extraterrestrial intelligence - assumes that if there is life, it must be advanced. And if ETs turn out to be wise and technologically advanced, what does that mean for religion? And does it matter if life originated from God or nature? You can read more about Peters' thoughts on aliens and evolution what that could mean for ethical first contact from a religious POV in his article for the Journal of Lutheran Ethics "Anticipating Detection of Life in Space: AstroEthical Scenarios". Watch the video of Peters' talk - what do you think? 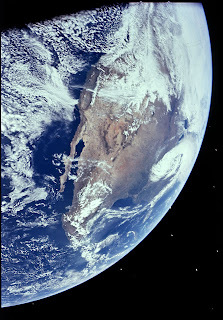 Image: View of North America from Apollo 16. Source: NSSDC Photo Gallery @ NASA.